Add the salmon filets to the parchment paper with a drizzle of avocado oil and season with Himalayan sea salt and black pepper. Bake for 15-18 minutes, until tender easily flaked with a fork. Cook pasta of choice until al-dente and then drain and set aside. Add the pasta back to the warm pot with the cream cheese, almond milk, and maple syrup. Cook over low heat until the cream cheese starts to melt, stirring often. Add more almond milk for a runnier “sauce” and less for thicker pasta. 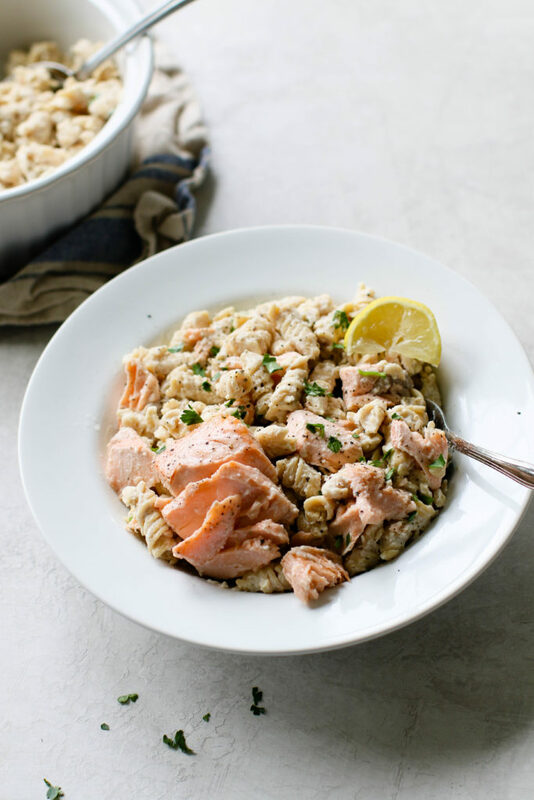 Slice the baked salmon into pieces and add to the sauce with the pasta. Toss to combine. Service garnished with a big squeeze of lemon and fresh parsley. Store leftovers in an airtight container in the fridge for 2-3 days.